We garden writers use the term “winter interest” so often that it’s in danger of becoming a cliché, so perhaps we should start uttering “consider the shape” when discussing good winter plants. This coming winter I urge you to start looking at the various shapes we have in our gardens—and maybe you’ll be pleasantly surprised. Take the delightful Corylus avellana ‘Contorta’, aka Harry Lauder’s walking stick. No one would buy it for its summer appeal; rather this shrub comes into its own after it has shed its leaves, thereby revealing its twisted, curly limbs. It’s enough to make us gardeners chuckle and wonder who was Harry Lauder. Another shrub/tree I would place in this category is the ubiquitous crape myrtle—but it is up to all of us to start noticing its graceful form exhibited during the winter. I will submit that there is a Lagerstroemia indica with its many cultivars appropriate for every southern garden. 1. We fail to do our homework first, as too many crape myrtles are improperly sited. Ranging from 5-33 feet in height depending upon the cultivar, many owners are unpleasantly surprised when their specimen balloons into a relatively tall tree. 2. We plant them too close to our houses and other trees, failing to give them the display room they so richly deserve. 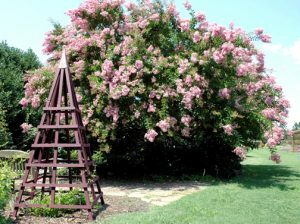 If allowed to grow on all four sides, the crape myrtle becomes a wonderful focal point to our gardens. Crape myrtles need room if they are going to look their best. 3. 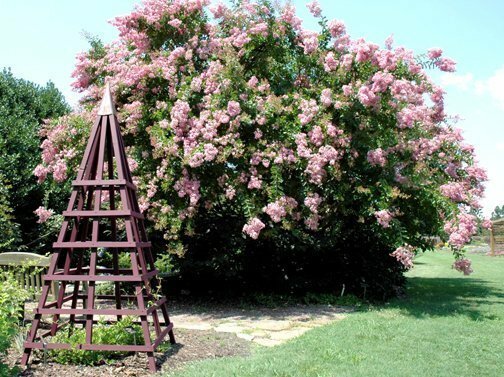 Some cut back their crape myrtles because they grew too large for the spot given—but this is not an excuse as there is a crape myrtle existing in every size imaginable. A scrunched up crape myrtle, whether it’s planted too close to the house or sited in the median between sidewalk and street, is an unhappy sight. However, the worst mistake we make is to heavily prune this beautiful tree in an effort to promote flowering. Old time gardeners love to cut the limbs back while others begin to yell, “crape murder.” First let me say that Lagerstroemia indica with its love of our heat and humidity belongs in our gardens and second, I will add that I’m firmly on the side of those screaming, “crape murder” as this practice totally destroys the appeal this shrub/tree holds for us in the winter. When we prune the limbs in an effort to create more flowers, we are encouraging weak water sprouts to grow out of the hacked limbs, resulting in a ridiculous, unnatural ball of foliage sitting on a multi-limbed shrub/tree. A couple of swipes with a pruner quickly destroy the lovely, slightly irregular, shape. This pruning results in a distorted shape in the winter when the leaves can no longer hide the ugliness—and I will submit that it is during the winter that crape myrtles should shine. The shape of multi-stemmed trunks with spectacular bark is a lovely one. Depending on the cultivar, the velvety smooth bark is a creamy tan, gray, or brown ending in long, tapering limbs. Some cultivars even have exfoliating bark. By cutting these long tapering limbs, the health of the tree is imperiled and we either have the choice of looking at unsightly feeble water sprouts or main limbs that look as though they have undergone a case of leprosy. So do me a favor; before you cut back your crape myrtle—correctly planted of course—please notice its lovely shape during the winter months.